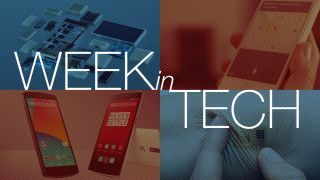 Another week, another avalanche of tech news you may have missed. We've taken Apple's CarPlay for a test drive, followed Facebook's F8 conference, and discovered a worrying trend among UK ISPs. Not only that, but we're celebrating the birthday of one of tech's major milestones. Is Apple's CarPlay, its system for iOS for in-car, any good? Not right now it isn't, says Michelle Fitzsimmons. While the interface is nice enough Siri is largely useless, there aren't enough apps and the functionality is extremely basic. Acer is moving upmarket, changing its focus from commodity PCs to more interesting products such as the Liquid Leap. The big challenge isn't the tech, though: it's the brand image. According to product marketing director John Miedema, "you'll still see a lot of people not considering Acer or still buying the Apple product because it's Apple." Given the choice between Google's Nexus 5 and the CyanogenMod-powered and terribly named OnePlus One, which should you go for? John McCann puts them head to head in OnePlus One vs Google Nexus 5 to discover just how much Android bang you can get for your smartphone buck. F8, Facebook's annual developer conference, was held this week. We didn't see any Facebook phones or other goodies this year, but we did see a revamped privacy system for apps including anonymous logins, a new mobile ad network and new ways to interact with apps. Google's Project Ara promises truly modular smartphones, but what other tech would benefit from the transformer treatment? We reckon smart TVs, in-car entertainment, smart watches, games consoles and human beings would all benefit from modular upgrades - and we discover the fake nails you can use to DJ in the bath. Where are the indie ISPs? A handful of ISPs have a chokehold on our internet access, says Jay McGregor. "Between 1990 and 1998 there were 19 independent ISPs operating in the UK. In 2014, those very same ISPs have either been absorbed by the big six (BT, EE, Sky, Virgin, TalkTalk and Plusnet), or are now completely defunct." That number could fall to just three, with serious implications for innovation and competition - meaning internet access could end up costing more and being worse. "Your mobile phone already knows where it is, how you're holding it, what you're saying to it and how fast you're moving," says David Nield - but that's just the beginning. Future phones could monitor everything from your blood sugar levels to the likelihood of an imminent avalanche. 10 PRINT "HAPPY BIRTHDAY, BASIC!"